Okay, so this is perhaps a tad late as were most of my entries for Doug’s fantastic Blogging Archaeology series. Just a quick re-cap for anyone that missed it: over a period of 5 months, from November 2013 to March 2014, Doug openly asked members of the archaeology blogging world to take part in an online blogging conference where each month he would set a question and hope that arch bloggers would answer the world over. Doug (who blogs at Doug’s Archaeology where he profiles the archaeology profession) was influenced and moved to start the blogging carnival back in November 2013 because the Society for American Archaeologists were, in April 2014 in Austin, Texas, having their annual conference which included a session on blogging archaeology (view the full preliminary program here). As he himself could not make the conference (and neither could many other archaeology bloggers), Doug decided to open the floor and host a monthly blogging carnival on his site where he posted a specific question each month for bloggers to answer on their own respective sites. Doug helped build up a fantastic collection of results and links each month detailing the wide variety of thoughts, experiences and wishes of the archaeology blogging world. Although the carnival has been over for some months now I have been meaning to collect together my own series of entries for the carnival. This is mostly for my own benefit as I am very interested to see how I feel about each question Doug posited in a year’s time or so, compared to what I felt at the time that I wrote the entry. It is in essence, I’m afraid, some blog navel gazing! But it is also a way in which to track the changes that I have made to the blog, both in content and approach, and also helps me remember what numbers of views and hits the blog achieved at a certain point. This was a two-part question consisting of ‘why did you start blogging’ and ‘why do you continue to blog (or not, as some have stopped)’. This post details the origins of this blog, of wanting to start it to improve my own knowledge and skills, and wanting to discuss and open up communication about my own bone disease. The second part of the post dealt with how the blog has expanded (with interviews, guest posts, skeletal series) and why this expansion has taken place. This, a three-part post, details the good, bad and ugly aspects of blogging archaeology in all of its glory. The good side is the ability to open myself up, talk about my passion and also discuss my own bone disease. Through this I have met many wonderful people. The bad is the lack of access to the journals whereas the bad isn’t so much bad as highlighting other blogs that do a fantastic job of highlighting the darker aspects of archaeology. This is in both the commercial and academic sense, and the personal sense (i.e. unpaid internships, poor job conditions, lack of recognition in sector and government, poor pay etc that can pervade through the industry). The January edition of the blogging carnival was interesting for people’s interpretations of what good best and worst could mean. In my entry I discussed the blog statistics, including overall page views, comments, and number of followers. I discussed the relevant merit of each basic statistical detail, but highlighted some shortcomings of each and of the WordPress format in general (although I do only use the basic free edition of the site). I also mentioned a basic trend that appeared in the statistics over the months and weeks, which correlated with what other bloggers of archaeology reported, that namely views tend to fall in the summer (our target audience is too busy excavating probably!) and perk in the winter season. As a part of the entry I also looked at the most popular and least popular posts, although there were no surprises there as the skeletal series are the most viewed posts. This is largely due to their collective attractiveness to a broad range of disciplines such as medicine, anatomy and forensics, and not just the archaeology sector. BA February: What Does it all Mean to Me? The February edition of the carnival was actually an open-ended question poised by Doug. Unfortunately it led to the lowest turn out, however I ventured a topic and asked what this blog means to me. In it I discussed the digital aspect of the blog, how information can change, transform and be curated. I also highlighted the fact that I see the blog as a part of my personal academic world, a place where I try to understand what is happening in my field (bad archaeology joke there!) and why. I also briefly discussed the social aspect of blogging through understanding the impact of blogging human osteology and bioarchaeology as discussed in a recent academic journal article, and how this view was rebutted and challenged by those very blogs it discussed. In the final entry of the blogging carnival Doug asked the bloggers what their future hopes were, how they thought their blogging may change or change them. In my response I further detailed my view on blogs as a space between the commercial, academic and voluntary worlds of archaeology, where they (the blogs) often rest on the shoulder of just one person and are often a reflection of that aspect; that they are an expression of interest in the chosen topic and a personal journal at the same time. I also discussed the idea that blogging validates our interest in our chosen subject, and that this is reflected by the recognition and reference of our sites as markers of interest or worth in the academic world (via article references) and/or by the public interest expressed. Further to this I highlighted the nature of the blog itself, both the presentation and the form, and how these can be changed and manipulated as the blogger sees fit. Ultimately, as Spencer noted in the comments, archaeology blogging bridges a gap, that we can provide, and that it is inclusive. The utterly fantastic outcome of the blogging carnival was the publication of the Blogging Archaeology (2014) book, edited by Doug Rocks-Macqueen and Chris Webster, in which beforehand the editors openly called for articles from the blogging community online. There are not many opportunities in the archaeological world where you can mix a full panoply of personal and professional perspectives as much as this publication has produced, from the worlds of commercial archaeology, academia, and the voluntary sector. It is an amazing 293 page volume which manages to fit in the breadth and beauty of blogging archaeology online discussing, as it does, a variety of topics in archaeology, heritage and digital media. This includes topics such as (but is certainly not limited to): understanding mortuary archaeology and blogging, understanding the commercial sector and social media use, teaching public engagement in anthropology, understanding the perceptions of archaeology and the language used when discussing the subject, to a range of personal reflections on blogging archaeology. The publication is available for free to read and download here. 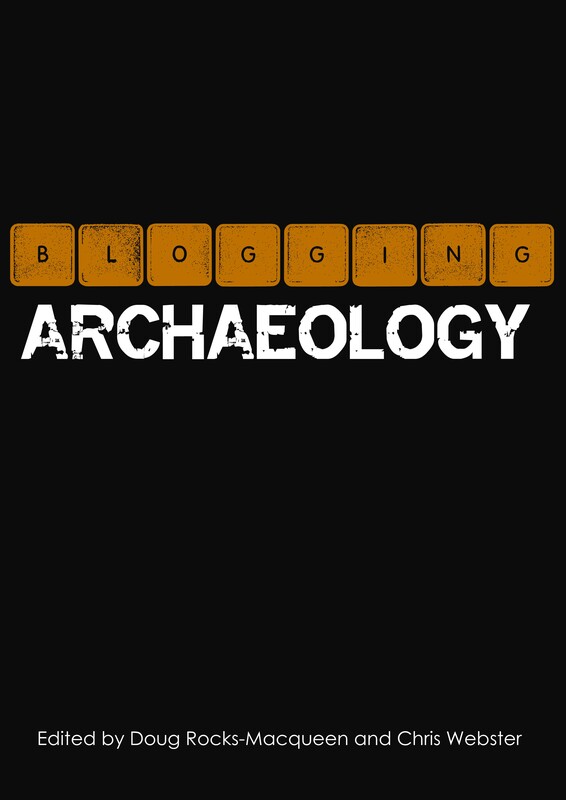 The front cover of the Blogging Archaeology (2014) publication. The volume includes a number of articles from prominent arch bloggers, including Katy Meyers (Bones Don’t Lie), Kristina Killgrove (Powered By Osteons), Sam Hardy (Conflict Antiquities) and Howard Williams (Archaeodeath). Read the book here. As I stated in my last entry for the series back in April, I sincerely hope that the archaeology carnival becomes an annually recurring feature of blogging archaeology online. There are certainly many potential subjects left to be covered by such a venture and the carnival truly brings an inclusive aspect to the archaeology blogging world and archaeology in general. It also helps to highlight the sheer amount and wealth of archaeology and heritage themed blogs that I, personally, had not previously known about. It has also shown that you shouldn’t be afraid about jumping into this world yourself, no matter what your background, interest or experience. It really is open to anyone who wants to write or talk about archaeology, where the number of platforms and ways to engage the audience is limited only by your own imagination. Overall the blogging carnival was a fantastic opportunity to reflect on what blogging meant to me, where it has taken me so far and where I hope it will take me in the future. So to Doug I say a big thank you for putting this together and for producing the publication. This is the third entry in a blogging carnival that Doug, of Doug’s Archaeology, started back in November last year. Just another quick recap: the whole idea of this blog carnival was started by Doug after he saw that the Society for American Archaeology are having their 79th annual conference in Austin, Texas, in April 2014. Doug specifically noticed that they are including a session on the rise of blogging in archaeology and, since he cannot be there himself, he thought it was pertinent to start a blogging carnival online to get the archaeology blogosphere alive with monthly questions. The questions are posted at his site in the first week of each month. The best and worst, readers may notice the slow evolution of this banner! I spent more time on this than I care to admit (Image credit, remixed with MS Paint). Last month a total of 58 amazing bloggers joined in answering the December topic of the Good, Bad and Ugly of blogging archaeology. This is an awesome number of people involved in spreading the word about the joy and sorrows of blogging about archaeology. My entry for December can be read here. Remember that if you are a blogger writing and posting about archaeology and you want to take part then go right ahead! Feel free to join at any point, answering the past questions is also encouraged. The previous past few months questions can be found here, please do jump in and join us! January’s topic is the best and worst posts. The topic is actually quite diverse and allows the blogger to approach it from whichever angle they want, either by looking at blog statistics or by talking qualitatively about the posts. I think it would be pertinent of me to discuss the posts in both ways. As much as I babble on about the blog here I rarely mention the site in person. Regardless I’ve always tried to be open about the blog’s visitor statistics, topics discussed and sources used on the blog itself. I really think only the audience can decide whether posts are good or bad. I know, this is a very lazy way of getting out of the question! But seriously I enjoy writing the majority of the posts here and I am happy to have produced a few that question politics in archaeology/forensic anthropology. Another bench mark that seems to be pretty popular for measuring good and worst amongst the blogging carnival goers is a statistical breakdown of the blog entry hits. For this blog it is undoubtedly the skeletal series posts that provide the big hits with the most views. As I’ve stated in an earlier carnival post the skeletal series was, to me, my unique selling point. It is a series of, as of yet, unfinished posts breaking down the constitute parts of the human skeleton (I will honestly finish them soonish). This naturally has cross over value for the medical fields and natural sciences, as well as to the aimed audience of the archaeology, human osteology, physical anthropology and bioarchaeology fields. I must say though that some of my best, or favourite, entries are ones I haven’t even wrote myself. The are of course the interviews or guest posts. As for worst? Hmm that is tricky one. I have a few posts that don’t really say anything at all, but they are a part of how the user uses the blog and how this develops naturally I’d say. I think I have changed in some way from how I originally used it to how I do now, but this is just a natural progression of what works and what doesn’t. For instance I once just posted a song (a smashing song though!) that wouldn’t really be of much archaeological value to viewers of the site, but it does have an integral meaning to me as to how I think about cultures and the processes that play behind the veil of archaeology (plus Gogol Bordello are amazing). There is no getting away from the fact that it is a small to mild thrill to check how many visits your site gets each day or so, and it is equally interesting to see the inevitable slumps and to hypothesize why they appear. The weekly stats are also vaguely reminiscent of medieval ridge and furrow landscape features, reminders of a past long gone. Although WordPress go out of their way to tell you how to optimize blog visits (I, for one, never knew about slugs before! ), it really is up to the blogger how much they advertise the site. I also include a large categories list and blog roll so the interested audience can click on whatever takes their fancy. In fact, apart from sometimes posting a blog entry on Facebook, I almost never advertise the site. To many this is probably a good way to kick yourself in the face but I do try interact with other bloggers and the folk that kindly email me. This is important in my view as blogging is a community: you talk to each other and learn from each other. Who knows, you may make a few good friends as well. The one other important rule that should be kept in mind for all bloggers seeking a bigger audience is to simply keep writing and producing posts! So because I’ve always been open and transparent about the site, let’s now have a look at the statistics and try to see if we can see any trends. The first thing to notice is the overall views for the blog, which is currently standing around 937,913 views from February 2011 to the current day (it is probably just me refreshing the page!). This is a good figure I believe, especially for a specialist blog such as this. There are 257 subscribers to the blog, a low number in relation to the views (maybe because I keep the email button on the bottom left?). Around 453 comments, half of which are me replying I believe, but is none-the-less a good turnout for the books. The best ever one day for views was 4354 views back in 2012, which was pretty sweet and surprising. As far as I can ascertain, or guess, I believe the blog views are fairly consist throughout a 24hr period, with no obvious peak viewing time noticed so far. Okay, so moving to the badly done cut and paste paint graphs below we can see some fairly obvious and repetitive trends occurring. 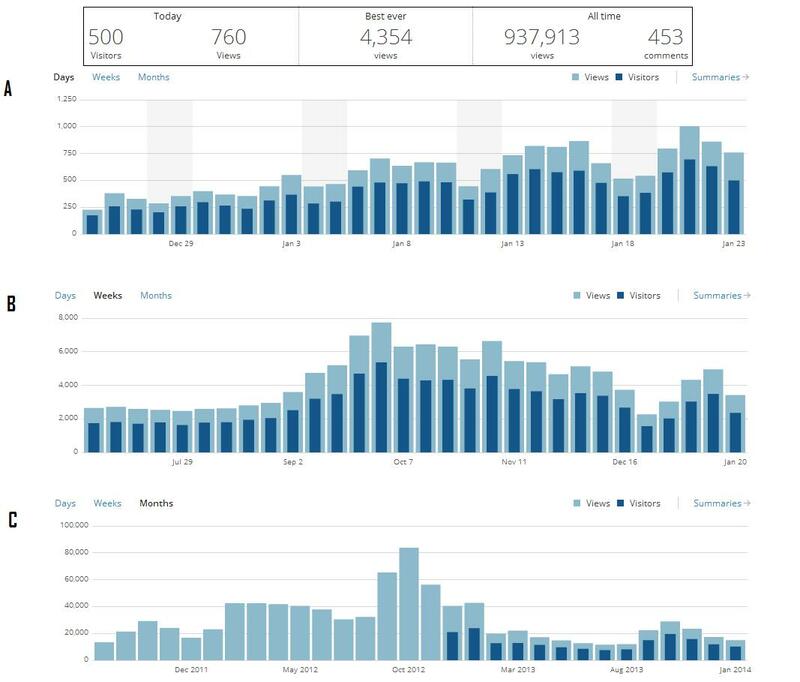 In graph A, which shows individual days, we can see a pattern whereby the blog is more popular for views during the weekday, that is Monday to Friday, as oppose to the weekends. Not particularly surprising as people will be learning or reading online at this point if they are at work or studying. Furthermore in graph A we can see some movement towards higher viewers from late December until today’s date. Not unexpected as we are moving away from a holiday period to one where work and study returns to a normal pace. Moving to graph B, and the number of views per week, we see a fairly consistent fall of views during the holiday weeks as suggested by the day graph. The summer period is noticeably quiet whilst the September/October/November periods are visibly quite busy. My initial theory is based purely on academic timetables and the fact that the first semester tends to be a heavy onslaught, especially at the Masters level where in most UK universities the teaching of human osteology and anatomy is most hands on at this point. However, as Doug has pointed out in the comments below, it could also reflect an archaeologists yearly working pattern. My statistics for the These Bones of Mine blog and yes, I used MS Paint. Initial thoughts on a) days: ah it is going up, b) weeks: aw it is all over the place but mostly down compared to a few months ago, c) months: ah it is really down compared to 2012! The differing blue bars highlight the fact that the site gets more views than actual visitors, but also note that this only came into effect around November/December 2012. The date for the stats go up to today, the 23rd of January 2014. (Click to enlarge). In graph C we can see some longer month-long trends of the blog. Perhaps most interesting is the peak of 80,000 plus views in October 2012, a distinct outlier, although a sudden and vaguely sustained peak is also noted for December 2011. Then we can see the great fall (I am holding back the tears!) starting around February/March of 2013. I am curious as this leads in with the change that WordPress made with the viewer stats, from lumping them all together as views to separating them to views and visitors in December 2013. Either way I am not too sure that would make that much of a difference looking at the views altogether. Sometimes Google just degrades you! What we can say is that we see the October trend, or what I am calling the First Semester Panic, is still distinct in each year of the blog. Summer also tends to be a dead time, likely due to extensive fieldwork being carried out. All in all I think the viewing stats back up my lazy assumption of academia having a fairly strong exertion or influence on when the blog is viewed (1, but also check comments). From the counter stats of the countries the viewers come from it is evident to see that the majority of the visitors are American, but the majority of net traffic is routed through America plus the country runs a lot of forensic anthropology and physical anthropology courses with often great internet access for the population. As such it is naturally a fairly big market. Second is the United Kingdom with Canada coming in at a distant third, the top three being all predominantly English-speaking countries (please note the country stats only go back to February 25th 2012). After this it is kind of free for all, with countries such as France, Pakistan, Malaysia, Thailand, Germany and South Africa all having fair hits in the low thousands. There are only a few countries that I’ve had no hits from whatsoever, unsurprisingly including North Korea as well as some sub-Saharan African countries. Moving onto the individual blog entry views can see that there is no real surprise in which posts are the highest viewed. People seem to like their bones! There isn’t too much to say in area either, although I am always curious as to what the outcomes would be if I changed the appearance or menus of the blog outlay. Statistics for the number of hits per blog entry, although I have cut them off as there are now around 150 separate blog entries. Note the very high number visiting the home page/archives of the site, probably due in some part to the large categories menu. Unsurprisingly the skeletal series posts are the most popular, with functional posts appearing higher on the list than reflective posts, guest posts or link posts. From the beginning of the blog until January 23rd 2014 (Click to enlarge, yes I used MS Paint again!). 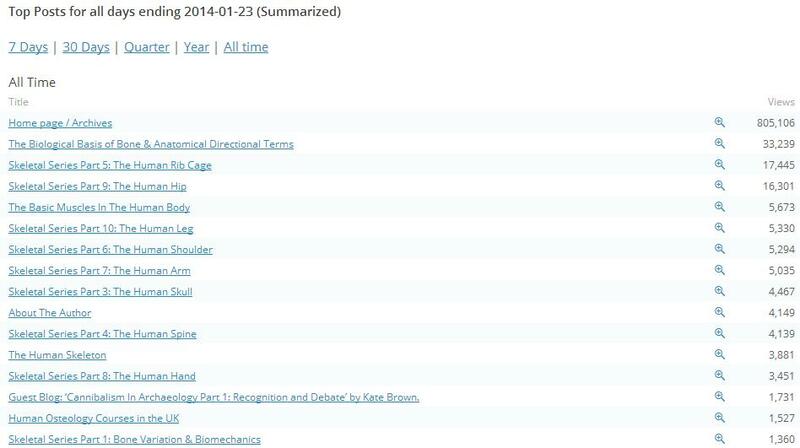 For some reason that beats me the post about the ribs is particularly popular, although by far and away the most popular post is the biological basis of bone and the anatomical terminology with a quite staggering 33,240 individual views. Thus I am sure you can imagine my horror when I went back to it recently and realised it severely needed a grammar and spelling miracle work-over. All top individual posts (discounting home page/archives) are to do with human osteology and not strictly archaeology at all, which is pretty interesting in itself. By far and away the best posts are the ones where I have had active feedback. However some of my personal favourite posts are the two interviews I have conducted so far. The first interview with Lorna Tilley on the new 2011 Bioarchaeology of Care methodology for investigating care-giving in the archaeological record has led to some fruitful discussion on research ideas and proposals. Also the opportunity has given me the lovely experience of being able to share my osteoarchaeological passion and photographic interests with a lovely person. The second interview, with Stuart Rathbone on field archaeology, has provided me with a great opportunity to learn more about commercial archaeology in Ireland and Britain. It was really interesting to his views about the field as a whole, the impact of the economic climate and what the archaeology excavations can do to the body. Also I don’t think it would be right to highlight some of my best posts without mentioning the wonderful guest bloggers, each and every one who have taken their time to read my ridiculous blog briefs and have written interesting and varied entries. Further to this I see it as almost a prerequisite of blogging that, where you can, you highlight the work and value of other bloggers, particularly of course those that are in a similar field. I have tried to do this, to highlight the vast shared wonder of the archaeological and osteological fields through the vast many blogs out there, but it may be a quixotic ideal for this blog alone. I should probably spend a bit less time staring at the screen and open that door to the great wide world! Joking aside, I am happy with the blog and the audience it has managed to reach. At the end of the day it all comes down to the viewing audience, the feedback on the site and the fantastic interviews and guest posts. So in a nutshell, my best posts aren’t my best posts at all, they are your posts. The next blogging carnival question will be up at Doug’s Archaeology in early February so please do jump in and join! The summation of the January blogging carnival topic of best and worst blog posts will also be up at the same time. (1). I’d love to hear other archaeology bloggers feedback of this, whether I am just seeing patterns and making wild hypothesise or you are also getting the same patterns as my statistics likely demonstrate. Feel free to comment or email me.